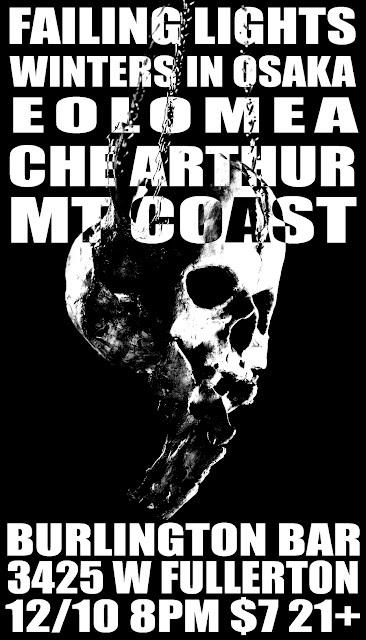 Failing Lights (Mike Connelly of Wolf Eyes), midwest noise supergroup Winters in Osaka, Che Arthur, Eolomea (Andre Foisy of Locrian and David Reed of Evenomist) and Mt Coast will be playing on Monday, December 10th at the Burlington Chicago. Winters in Osaka's unique blend of "creep ambient" has been evolving with every show making each live experience unique so it's always a good idea to catch as many of their shows as you can. I haven't heard any of Mike Connelly's solo stuff but I like his work with Wolf Eyes, plus they were one of the loudest shows I've ever heard when I saw them at the Bottle years ago. Che Arthur is the head of Past/Futures Records and has been with many bands but I find his solo experimental guitar work to be his most interesting. This will be Eolomea's first show. Eolomea are currently working on an LP to be released in 2013 on Black Horizons.